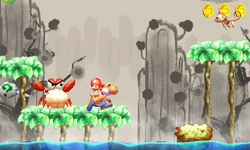 Ukiki Trouble in Clawdaddy Cove is the sixth level of World 3 found in Yoshi's New Island. Yoshi starts the level in a jungle-like area with some enemies, obstacles, and an arrow which leads to the next area. Here, a Whirly Gate transforms Yoshi into Jackhammer Yoshi, which must complete an obstacle course in order to appear in the next area. Here, Yoshi must avoid some enemies and eventually reach the Goal Ring. Like Ukiki Jammin', the background in this level is based off of Japanese oil paintings. This page was last edited on April 15, 2019, at 12:08.